Quick Breakfast Recipes. Quick Indian Breakfast Recipes. Everybody seems to be in a hurry all the time, and the hustle-bustle peaks in the mornings! Breakfast is an instant energy booster. It starts your body metabolism and helps in breaking down calories further. If it is not possible to make breakfast within 10 to 15 minutes, people are even ready to skip this essential meal of the day. Not to worry – this Quick Breakfast section with filling and tasty breakfast dishes will ensure that you never have to miss breakfast again. Maharashtrian famous delights which are familiar to most of us are Kanda Poha, Batata Poha, Sheera. It is consumed by 75% of Maharashtrians in bigger cities as breakfast. Traditional breakfast choices like Kanda Batata Poha or Batata Poha are easy and quick too. They taste best when eaten hot with a dash of lime, but it can also be carried in the tiffin box. Enjoy a cup of Masala Chai with this and you are ready to face the day! Gujarati famous Methi Thepla can be made and stocked up to 15 days. You can quickly whisk some curd and add some spices and relish it with the thepla. Chila, the authentic Indian besan pancakes can be made in innovative ways, by adding your choice of colorful, crunchy vegetables, greens or other ingredients to make it as exciting as you want. Try these Stuffed Chilas made by stuffing with wholesome and flavourful sprouts mixture tossed in butter. Punjabi famous paratha and stuffed parathas are also an amazing breakfast, it can keep you energetic till your lunch time as they are very filling. Check a wide range of Breakfast Theplas, Parathas recipes and enjoy them with a bowl of curd, pickles or a glass of sweet lassi. Upma is a beloved breakfast from Southern India. It is made by roasting semolina, adding spices and finally tempering with aromatic ingredients like mustard seeds, urad dal, curry leaves. You can enhance the taste by adding tomato puree and make a tangy Tomato Upma. You can even substitute semolina with Jowar, Broken Wheat, Quinoa, Soya granules to make lip-smacking, healthy Jowar Upma, Broken wheat upma, vegan Quinoa Veg Upma or an iron-rich Soya Upma. Adding vegetables not only makes it more colorful and tasty but, also adds a crunch to the upma. Other than that, South Indians are ardent lovers of dosa, idli, vada with coconut chutney and sambhar. These delicacies are loved equally in the rest of India. Dosa is thin, a crispy pancake made using a batter of rice and urad dal. They are roasted using oil, ghee or butter! A sada dosa can be upgraded to a tongue-tickling delight by stuffing with a variety of mixtures. Palak paneer dosa, Paneer chilly dosa, Mysore masala dosa, Spring dosa are some popular dosas from the streets of Mumbai that can be eaten as snacks. Other than that, you can try making Instant Oats Dosa or Quick Mini Soya Dosas that requires no soaking, grinding or fermenting. Uttapam is thick pancakes made from the same batter. Bread uttapamcan be made instantly and tastes as good as authentic uthappam with the added advantage of being really easy. A cup of South Indian Filter Coffee with this spread completes your breakfast platter. Idli is fluffy as cotton balls, white as the moon, steamed cakes made using par-boiled rice and urad dal. Try making Oats Rava Idli or Quick Rava Idli that does not require any fermentation and come in very handy when you do not have enough time to prepare anything else in the morning! Breakfast delights like Cucumber Cottage Cheese Sandwich can be easily made by kids because all they have to do is make a stuffing by mixing an array of ingredients and simply sandwich it between two slices of bread. Also, they can make Cheesy Paneer and Parsley Toast as they just have to mix cheeses with herbs, lay it upon toast, top it with olives and enjoy! Have too many leftover breads from last night's dinner? Make a quick-fix breakfast like Chatpata Dahiwala Bread with desi shades of a tangy curd masala that are sure to delight your palate. Also, a stack of extra rotis can be transformed into a flavorful Dahiwali Roti, balanced with jaggery, spices and an aromatic tempering. Eggs the most versatile and a staple breakfast ingredient is extremely easy and quick to prepare. It is economical and also, provides our body with a nice dose of protein. Omelette is a popular breakfast dish made by frying beaten eggs with butter or oil. You can perk it up with spices and finely chopped vegetables and make a peppy Masala Omelette or add everyone’s favorite cheese to add a gooey dimension and create Veg Cheese Omelette. To make it more scrumptious you can make an Omelette Sandwich or Mumbai roadside famous Masala Omelette Pav. Start your day tastefully, with this delicious Egg Bhurji and a slice of toasted buttered bread. Eggs can be quickly cooked into a pot of boiling water and transformed into boiled eggs. Depending upon the boiling time, they can be made into Soft Boiled Egg, Hard Boiled Eggs. Simply sprinkle with salt & pepper and enjoy! Stock up your air-tight containers with oatmeal, muesli or granola mix. Grab a handful of cereals and add some chopped fruits, dry-fruits , roasted seeds with milk and your healthy breakfast bowl is ready!! Our section of breakfast cereals will help you with some delicious yet healthy combinations. Fresh fruit and vegetable juice or smoothies are a great alternative. To ensure a healthy lifestyle and what combinations work well, make these tried and tested Juices and Smoothies. Some like the Banana Apple Smoothie will be ready in just five minutes. It can be carried along, so you can finish breakfast on-the-go! Enjoy our Quick Breakfast Recipes. 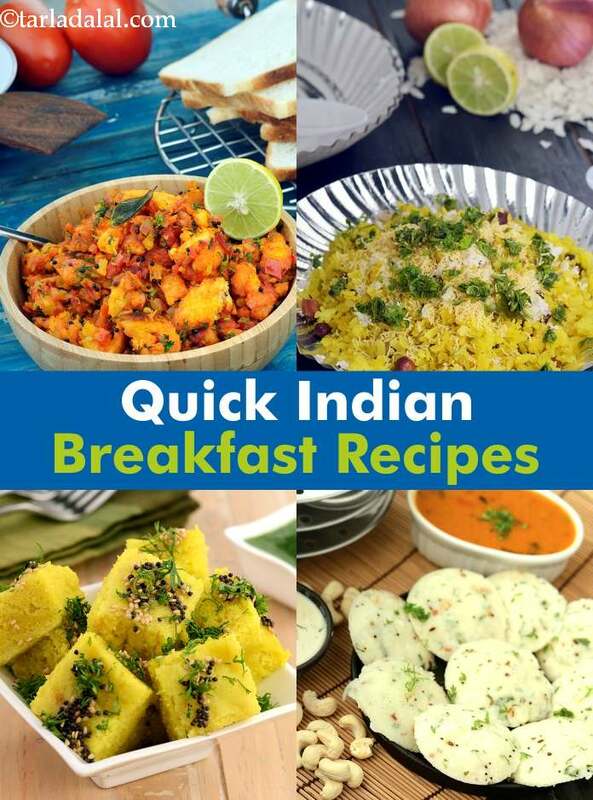 Quick Indian Breakfast Recipes and other quick recipe articles below. Eliminating rice reduces the calorie count of these spinach idlis, making them suitable for diabetics as well. The same moong dal batter can also be used to make healthy pankis and pancakes. Need an excuse to start your day with some chocolate? add it to this cocoa milkshake! this cold confection makes a good substitute for coffee, especially when the weather is hot and you don’t fancy a hot beverage or a cooked breakfast. A colourful roti tinged by the pink shades of beetroot and the savoury touch of til, with coriander powder and chilli powder for added flavour, the Beetroot and Sesame Roti is an ideal breakfast to pack in your kids’ lunch boxes as it is non-messy, tasty and healthy too! A versatile, anytime snack that can be eaten as it is or combined with warm milk and chopped fruits. Who says a person cannot feast when fasting! faral means "fast" and these pattice are designed specifically for those who are fasting. The coating of arrowroat adds a unique dimension to this otherwise common dish. Served with sweetened curds, to complete the mast experience! Once a gujarati staple, steamed and low cal dhoklas are universally popular these days! they make a particularly wholesome and light breakfast. Add sprouted moong and spinach to add colour and make them more nourishing. These instant pancakes require no advance preparations. Just whip them up in time for a quick breakfast or tuck them into your child’s tiffin box. Besan and potatoes act as binding agents and ensure the pancakes are of the right texture. Feel like having dhoklas for breakfast? you can whip them up instantly by using beaten rice, which requires no soaking or fermenting. These dhoklas also make a good tiffin option since they do not need reheating. Green chutney balances the not-so-spicy dhoklas. Drink your vegetables for a change! In addition to tasting great, this melange of carrot, capsicum and tomatoes will do great things for your eyesight. Vitamin c-rich capsicum will also help build immunity and ease stress before you set out for the day.